In the aftermath of the vote for the UK to leave the EU, several possible scenarios could allow Scotland to remain in, writes Eve Hepburn. She argues that, while it may prove difficult for Scotland to block Brexit or to keep EU membership while the rest of the UK leaves, it would also face challenges in attempting to join the EU as an independent state. In the aftermath of the Brexit vote – whereby Scotland voted 62 per cent in favour of remaining in the EU, but 52 per cent of the UK as a whole voted against – Scottish First Minister Nicola Sturgeon has stated that the prospect of taking Scotland out of the EU against its will is ‘democratically unacceptable’. 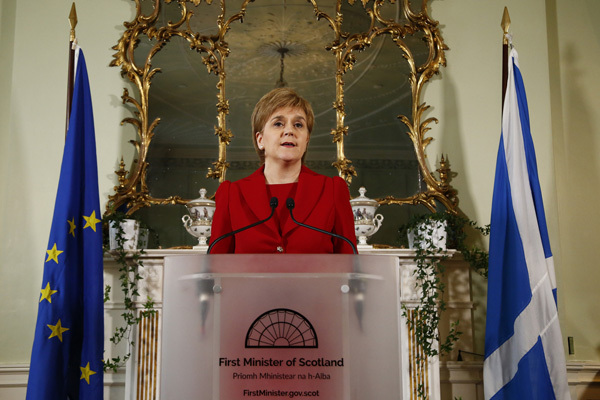 Sturgeon has vowed to explore all options to keep Scotland in the EU. But what might these options be? And how likely are they to be successful? Here I will try to identify four possible scenarios – amidst myriad possibilities and uncertainties – that might allow Scotland to stay in the EU. The first scenario is that the UK does not exit the EU after all. The process of withdrawing from the EU and disentangling UK laws from forty years of European legislation and directives, is going to take many years of negotiation. Indeed, PM David Cameron has left the decision to activate Article 50 – setting a two-year countdown to Brexit – to his successor, whoever that might be, at a later point in time. During these years of negotiations with Brussels, we may see changes in leadership (especially if an election is called), raising the possibility of the UK government seeking to steer a different course on the UK’s relations with Europe. Furthermore, the UK Parliament will be able to vote on any withdrawal deal. Given that there is a current majority in favour of remaining in the EU, they may withhold their consent and/or demand some form of ‘EU membership light’ – if, of course, that’s even possible given the attitude of EU leaders towards the UK right now. SNP MPs are likely to be active in opposing any withdrawal treaty in the UK Parliament. If UK exit from the European Union is, on the other hand, pursued and approved by both the UK government and a majority in the UK Parliament, then it is arguable that such significant legislation should also be approved by the devolved administrations. And it is highly likely that a majority in the Scottish Parliament will not approve the Brexit withdrawal deal (given that MSPs are overwhelmingly in favour of EU membership) – or, in legal terms, Scotland will ‘withhold legislative consent’. This may (or may not) put a spanner in the works for Brexit. Under the revised Scotland Act, Section 28, ‘it is recognised that the Parliament of the United Kingdom will not normally legislate with regard to devolved matters without the consent of the Scottish Parliament’. While the EU is a reserved matter, European legislation has a huge impact on devolved matters (indeed, by some estimates, 80 per cent of devolved legislation in Scotland is affected by the EU) and thus exiting the EU could be interpreted as changing the nature of the devolution settlement and thus devolved matters. However, this is a complex legal issue, open to political interpretation, and the UK might decide to ignore the Scottish Parliament’s withholding of consent to withdraw from the UK, or indeed narrowly reject the interpretation that EU membership affects devolved matters. Though it is also possible, given that the majority of MPs favour EU membership, that the need for Scottish consent could be used as a political weapon to defeat any ‘full withdrawal’ treaty at Westminster under the first option above. Scotland (and NI) Stays – The Rest of the UK Leaves? If Scotland’s attempt to withhold consent on Brexit does not have the desired effect, and the UK Parliament and Government plough on with Brexit regardless, there is a third (far more tricky) option. Scotland could try to retain EU membership (possibly together with Northern Ireland), by representing the part of the UK that seeks to remain in the EU. Here, the closest model is Greenland, which seceded from the EU in 1985 while still being a part of Denmark. However, this model may not be easily transplanted to the UK-Scottish situation. Greenland has a different constitutional relationship to Denmark – it is a ‘federacy’, with much stronger powers to veto any Danish/external attempts to alter its competences. Indeed, Greenland has the right to veto any international treaty that affects its powers. Scotland, at present, does not have such legislative clout. If it were a federacy, then Scotland would have been able to reject more easily Brexit as negatively affecting its competences. Still, Greenland provides a useful example of only part of a state seceding from the EU, which could form the basis of a legal case to keep Scotland (representing the UK) in the EU. The final option, if all else fails, is for Scotland to hold another referendum on independence. Nicola Sturgeon has confirmed that this option is on the table, given the ‘significant and material change in circumstances’ that a possible Brexit creates. However, there are a few hurdles to achieving the desired outcome. First, there would have to be a large and sustained swing in support in favour of independence. A few days after the referendum, a poll put support for independence at 59 per cent. However, Sturgeon has previously said that she would not seek another IndyRef until polls consistently showed that 60 per cent of the public wished to leave the UK. It is too early to say whether this level of support will be sustained. Second, the UK government would have to agree to another IndyRef, which is probable, but new conditions may be imposed on any future agreement with Edinburgh. And third, the EU would have to approve Scotland’s application. Here, it is likely that Scotland would have to apply as a newly independent state under Article 49 of the Treaty on European Union, though given its previous EU membership and compliance with EU laws Scotland’s application may be fast-tracked. But this all depends on the views of EU Member States. And while a senior German politician recently said he would welcome Scotland in the EU as a new member, other states facing secessionist movements at home – such as Spain, Belgium and Italy – may not be so sympathetic. Dr Eve Hepburn is Senior Lecturer in Politics at the University of Edinburgh. Her research interests include Scottish politics, European integration, territorial politics, regionalism, federalism and multi-level governance. She is also Associate Editor of Scottish Affairs. Great read thanks. I personal would prefer the independence route as the other options seem to be overly complicated. Even if we did not get fast tracked we would know that we will be in the EU again later on down the line. Excellent analysis, many thanks. Well, personally I would believe that States facing secessionist movements at home – Spain, Belgium and Italy – could face some political difficulties and strong criticism, at European level, if they tried to resist the entry of Scotland as a new Member State (in the event of Scottish independence). They could realize, on a deeper consideration, that it is not in their interest to ostacolate Scottish membership. The case of Scotland is completely different from the cases that Spain, Belgium and (to a certain extent) Italy may face at home; none of these countries has had a referendum on EU membership and all these countries have been supporting the EU project. None of them has ever been facing the prospect of being dragged out of the EU against the will of the majority of their people. Moreover, the exit of a country is a negative event for the EU. For these reasons, Scotland – in the event of a second independence referendum – could present its choice both as an inevitable route for its EU membership and as a beneficial choice for the European project itself, given that those three countries have been consistently supporting the European construction (two of them being founding Member States, and Spain being traditionally pro-European). Trying to resist the entry of a pro-European country, an entry which ultimately would benefit the EU especially (after the difficult moment caused by Brexit), would not be in the political interest of countries which have been portraying their images as pro-European countries (additionally, an independent Scotland would have the support of other Member States without those secessionist movements at home). If Scotland became independent of the U.K. at the same time as the UK left the EU could it not remain in the EU as part of the “arrangement” under article 50 rather than having to apply under article 49? This would have a lot of advantages, one being that Spain would have nothing to fear from such a precedent unless it chose to leave. Also only a qualified majority would be needed under article 50.